WASHINGTON, D.C. -- In 2015, 34% of Americans say they are satisfied with current U.S. abortion policies. This is the lowest percentage since Gallup first asked the question in 2001. In three of four years since 2012, less than 40% of Americans have been satisfied. Yet between 2001 and 2008, at least 40% were satisfied every year. Gallup asks Americans about their satisfaction with the nation's policies regarding abortion as part of the annual Mood of the Nation Poll, conducted in January. The poll was not conducted from 2009-2011. Between 2001 and 2008, an average of 43% of Americans were satisfied with U.S. abortion policies; since 2012, the average has been 39%. One factor contributing to the drop in satisfaction with abortion policies is significantly lower satisfaction among Republicans since 2012. From January 2001 to January 2008, after the election of Republican George W. Bush and spanning most of his two terms, at least 39% of Republicans each year said they were satisfied with the nation's abortion policies. Satisfaction among Republicans reached as high as 44% in January 2002, Bush's first year in office. However, since 2012, with Democratic President Barack Obama in office, no more than 29% of Republicans have been satisfied with the nation's abortion policies. And Republicans' satisfaction is particularly low this year, at 21%, an eight-percentage-point decline from a year ago. Satisfaction among Democrats and independents these past four years has been roughly equivalent to what was observed, on average, from 2001-2008. At 46%, Democrats continue to be the most likely of the three party groups to say they are satisfied with the nation's abortion policies. Independents remain more satisfied than Republicans, at 36%. Between 2001 and 2008, satisfaction among independents and Republicans was remarkably similar, while Democrats were generally only a few points more satisfied than Republicans. However, since 2012, Republicans have been at least eight points less satisfied than independents. In 2015, there is a 15-point gap between Republicans than independents, and 25 points between Republicans and Democrats. Americans who say they are dissatisfied with current abortion policies were asked a follow-up question to learn if they are dissatisfied because they want current abortion laws to be stricter or less strict. This year, of those who are dissatisfied, twice as many prefer stricter rather than less strict laws: 24% want stricter laws, while 12% want current abortion laws to be less strict. Republicans' overall dissatisfaction with abortion policies has risen from 50% in the Bush years to 62% since 2012, with the 12-point increase distributed mainly among those who want abortion laws to be made stricter and those who want the laws to remain the same (up five points each). The percentage dissatisfied and favoring less strict laws has risen only two points to 7%. At the same time, no meaningful changes have occurred in Democrats' and political independents' views on these questions since Obama became president. 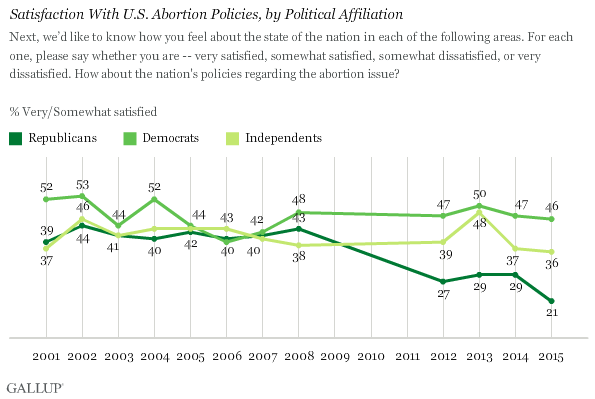 Democratic satisfaction with abortion laws averaged 46% from 2002 to 2008, and 47% between 2012 and 2015. 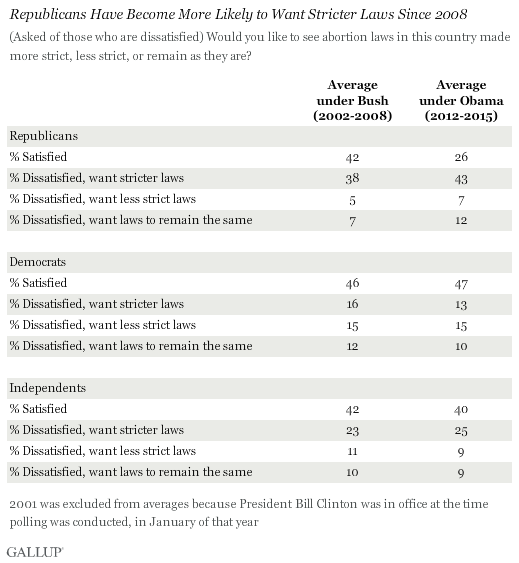 Democrats remain the party group most likely to say they are dissatisfied with abortion laws and want them to be less strict, at 15%. Americans' satisfaction with U.S. abortion policies has dropped in recent years, mainly because of a decline in satisfaction among Republicans. Compared with the 2002-2008 period, Republicans are now less likely to be satisfied with the nation's current abortion policies. They are now also more likely to say they feel laws should be stricter than was the case before. This shift in attitudes most likely reflects the change from a pro-life Republican president to a pro-choice Democratic one. Notably, Democrats' views have not become more positive after the change in presidential administrations, perhaps because abortion is the law of the land. This survey was conducted just before a recent proposal from the Republican-controlled Congress to ban all abortions after the mother has been pregnant for more than 20 weeks. While Obama had threatened to veto the bill if it passed, the bill stalled in the House because of pressure from female Republican lawmakers. While this bill failed at the federal level, at least three state legislatures, in Wisconsin, West Virginia and South Carolina, plan to debate a version of the ban. Rank-and-file Republicans are likely to support bills like this, but many independents and Democrats, both of whom are more likely to be satisfied with current abortion laws, may have issues with new legislation, especially if it makes abortion laws more strict. About half of U.S. adults, 51%, believe most Americans are "pro-choice" on abortion; 35% say "pro-life." The perception that the pro-choice viewpoint prevails contrasts with the nearly even division of Americans' actual abortion views. Forty years after the Supreme Court issued its opinion in Roe v. Wade, significantly more Americans want the landmark abortion decision kept in place rather than overturned, 53% vs. 29%.